The Canadian-born Berger averaged 42.7 yards punting and was successful on 19 of 32 field goal attempts in college at Colorado. He was chosen by the Philadelphia Eagles in the sixth round of the 1994 NFL draft but was waived five games into the season. Berger was picked up by Cincinnati but saw no action and was released from the practice squad. He also was inactive with the Bears and Packers in 1995 before Minnesota signed him in ‘96 and he averaged 41.1 yards on 88 punts. His average rose to 42.9 in 1997 and 44.7 in ’98 and he was also valued for his kickoffs. Vikings went 10-6 to finish second in the NFC Central and qualify for the postseason as a Wild Card entry. Won Wild Card playoff over Dallas Cowboys (27-10). Lost Divisional playoff to St. Louis Rams (49-37). 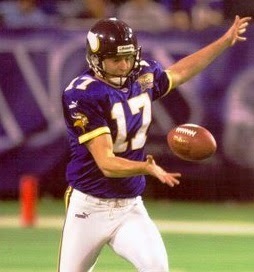 Berger spent two more years with the Vikings, again leading the NFC with a 44.7-yard average in 2000, before he was released after a 2001 season in which he was bothered by neck and back injuries. He moved on to the Rams in 2002 and then New Orleans in ’03. Berger was selected to the Pro Bowl for the second time in 2004, when he was also an All-NFC selection of Pro Football Weekly. After one last year with the Saints, he played for the Cardinals, Steelers, and Broncos in 2007, ’08, and ’09, respectively. Overall, over the course of 14 active seasons Berger averaged 42.9 yards on 847 punts, with three blocked.